When it comes to aging, one of the crucial factors to staying healthy and living longer is regular exercise. 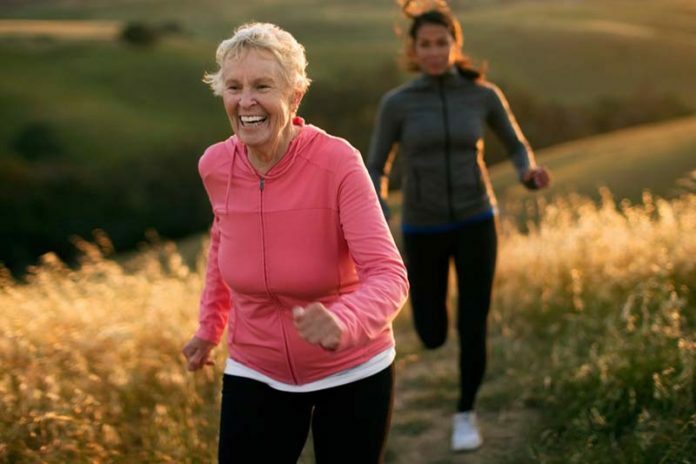 The motivation to get up and moving might be missing for your senior mom or dad, especially if they already have a chronic condition like diabetes or high blood pressure, but you could be the key to their success. Practicing yoga is always more fun with a friend, and what better exercise and meditation companion than mom or dad. Yoga has been shown to aid senior health by lowering blood pressure, reversing bone loss, and loosening stiff joints and muscles. The gentle, fluid stretching, reinforcing body poses, deep breathing practice, and mindful meditation make yoga a multi-faceted fitness activity that benefits the body and mind. Join your parent at a yoga class at the local senior center or gym, or live stream free online yoga tutorials right in the comfort of your mom or dad’s own home with Youtube. Yoga styles customized for older adults might involve using a chair or other props like yoga blocks, and some classes are even offered in the pool. Hiking is one of those family-friendly fitness activities that is perfect for pairs or large groups. As a low-impact exercise, hiking is easy on older, stiffer joints and still generates a beneficial cardio workout. Tailor your choice of hiking trails to your parents’ mobility and fitness levels, but don’t shy away from longer distances or steeper inclines as you both build up endurance. A 160 lb. person might burn over 400 calories in an hour of hiking, making it a great way to manage a healthy weight and prevent common medical conditions older adults develop like heart disease and diabetes. Enhance your hike by packing a light lunch to eat at the summit, taking pictures, and having your mom or dad pick out the trail they want to try next. Volunteering is a favored hobby of retirees, and if your mom or dad falls into that boat, it might just be the fitness activity they’re willing to try. Lots of volunteer opportunities and service projects incorporate physical labor into the job – packing and stacking boxes at the local foodbank, walking dogs for the animal shelter, picking up trash at the community cleanup day, or delivering meals to people in need. Worried about your mom or dad getting in and out of the car? Have them try a helpful swivel seat to simplify car transfer – more info here. Volunteering has been shown to help lower risk for developing hypertension in older adults, improve cognitive functioning, lower stress levels, and boost mood and feelings of positivity. Find fun, active volunteer opportunities near your with free tools like VolunteerMatch.org and CreatetheGood.org. While crafting doesn’t immediately seem like “fitness,” the fine motor skill practice is actually great exercise for your mom and dad’s brain. Retaining cognitive function and combatting debilitating conditions like Alzheimer’s and dementia is so important as your parents age, and activities which require the use of the fingers and hands can play an important role in doing just that. Origami, scrapbooking, making holiday wreaths, sewing, quilting, crocheting, knitting . . . the list goes on! Learning new skills and honing fine motor practice helps to strengthen the communication pathways between brain cells. The stronger and bigger your parents’ reserve of undamaged neurons and synapses, the more they have to rely on as they age. Turn your fitness foray into a way to help others by inviting your parent to join you in a charity walk or other athletic event (5K, color run, etc) that raises money for a cause you both care about. Charity walks serve a dual purpose of encouraging you and your aging parent to exercise while also giving you the boost of positive feelings associated with giving back. Many charity walks and runs are held to raise awareness of various diseases and conditions like MS, breast cancer, and Alzheimer’s which might already affect your parent or someone else in your family. Exercising with a sense of purpose by participating in a charity athletic event is bolstered even more when your family raises money as a team that is donated to research or to help afflicted patients. What if your aging parent has trouble completing daily tasks like getting dressed? Is exercise really viable? Absolutely! Assistive devices like you see here could help them achieve more with less effort in their own home, and give them the confidence boost they need to tackle an effective exercise habit. Routine exercise will not only benefit your loved one’s health, but their sense of purpose and self-reliance too.